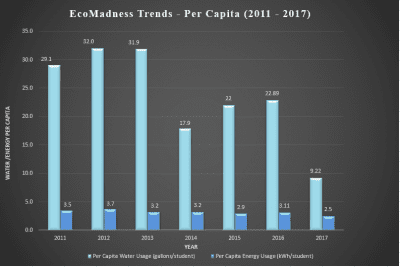 EcoMadness is a month long energy and water conservation competition. Each participating building has its own meter which measures the amount of water (in gallons) and the amount of energy (in kilowatt-hours) per day. These numbers are divided by the number of students in the building so we can find the energy and water usage per capita in each dorm. The dorm standings will be updated at least once a week during the competition so that everyone can keep track of the progress they are making. 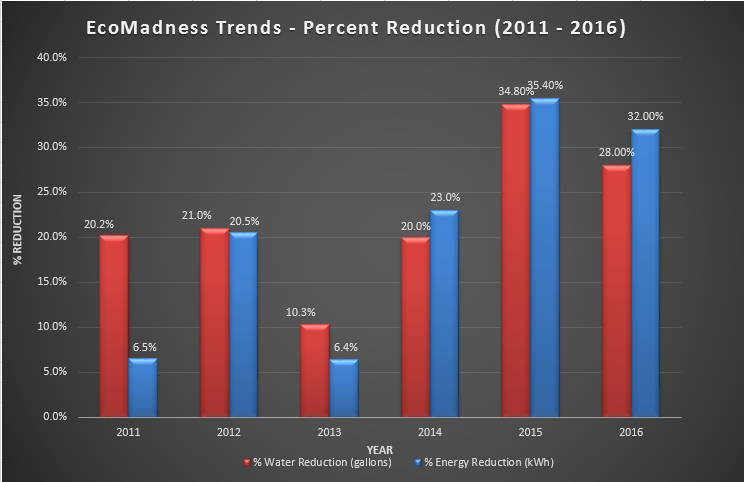 At the end of the month long period, winners will be announced based on who had the largest reduction of energy and water usage and who used the lowest amounts of energy and water overall. Please take the EcoMadness Pledge! By taking this pledge you are dedicating yourself to actively participate in EcoMadness by doing your best to reduce your energy and water consumption. You can print out the pledge (found under "Advertising Resources"), cut off the excess paper (make sure to recycle it!) and tape the pledge to your door so that your fellow residents may know that you are committed and be inspired to join in the effort to conserve. Pick one or two things from the list of tips for conserving energy and water and write them on the lines provided. It will be your goal to, at the very least, stick to the tips you have chosen. For example you may choose to pledge to turn off your lights every time you leave the room, or to do your best to take shorter showers. So post your pledge today and good luck competing in EcoMadness! Only wash your clothes if you have a full load to do. Pool laundry with your friends to make full loads! Report all leaks to your CA or ResLife immediately! Turn off the water when brushing your teeth, washing your face, shaving, etc. Take shorter showers! This will save between 5 and 10 gallons of water per minute. Don't flush any type of garbage down the toilet. Every flush uses around 7 gallons of water! When washing dishes, use a full sink of warm water instead of running the faucet continuously. Turn off the lights when nobody is in the room! This goes especially for bathrooms and common rooms when they aren't occupied! Avoid the "phantom load". Appliances such as your TV, DVD player, cell phone charger, etc. consume energy just by being plugged in. Unplug them when not in use! Turn down your thermostat before going to bed. For every degree you reduce it, you will save 5% on heating. Wash your clothes in cold water. It works just as well as warm water, will keep colors from bleeding, and saves the energy that would have gone to heating the water! 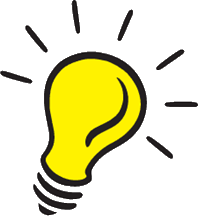 Install compact fluorescent lightbulbs in your lamps. They use 1/4 the electricity of a normal bulb. Power down your computer when not in use. For desk tops, turn off the monitor when you aren't using it. Click here to view the final results from EcoMadness 2017! Click here to open the full results for week 1. Click here to open the full results for week 2. Click here to open the full results for week 3. Click here to open the final results from week 4! Jeopardy: Test your knowledge and see who’s been reading the bulletin board! Set up in teams and have a friendly jeopardy face off! Green Scavenger Hunt: It’s a race against the clock! Split your residents into partners or small groups and send them on a hunt through the dorm and out around campus to find UConn’s sustainable features. Short shower floor competition: This one is on the honor system. Tape a log sheet on the wall by the shower and have residents post their shower times throughout the week. The floor with the shortest overall time for the week (or shortest per capita) wins! Seed planting (discuss with your hall director, we cannot provide seeds or pots): Gather residents to plant a seed that will grow into a beautiful flower in their room. Great for decoration and bringing the outdoors inside. 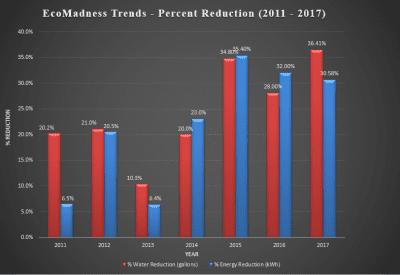 In the water reduction category, Allen/Kingston of Towers claimed first place with a 10.3% reduction in their water usage. In second place, close behind, Sprague of East campus had a 9.6% reduction. Hanks of Northwest experienced a 4.9% reduction in water usage. Congratulations to all of the dormitories, and congratulations especially to Allen/Kingston for being such a leader in water reduction! In terms of water usage per student, Sprague took first place with only 31.9 gallons of water used per student. Excellent work! 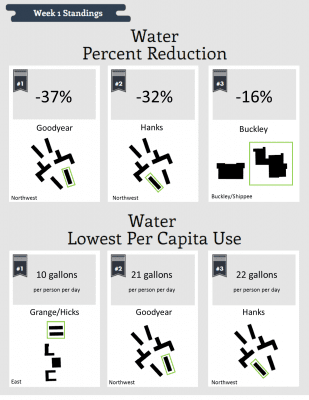 Two dormitories of Northwest took second and third place – Terry and Hanks – with 33.3 and 33.9 gallons of water used per student, respectively. Way to go! Very impressive numbers all around! Although the competition has ended, we should all remain especially mindful of our water usage due to a recent lack of rainfall. Remember to still shorten the length of your showers, watch out for leaving water faucets running and only wash your clothes if you have a full load. 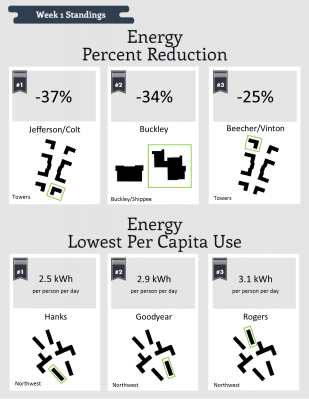 The winner of energy reduction is Beecher/Vinton of Towers with a 6.4% reduction in electricity usage. 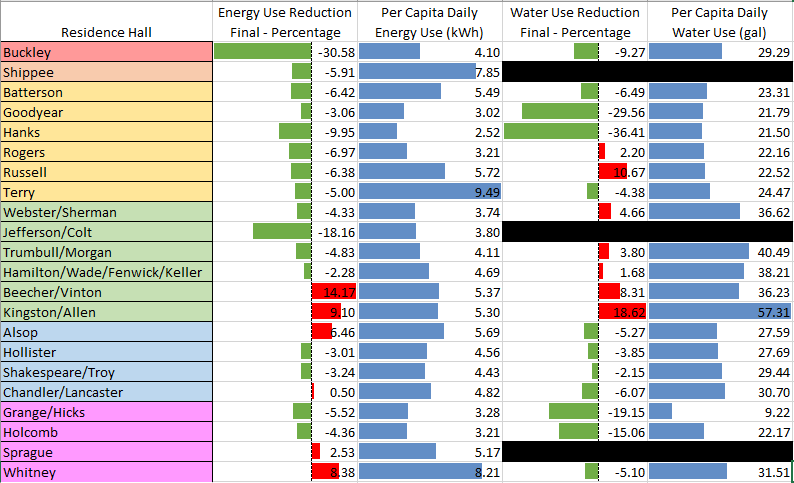 Very, very close behind was Whitney of East campus with a 6.3% reduction – a 0.1% difference in electricity reduction. So close! 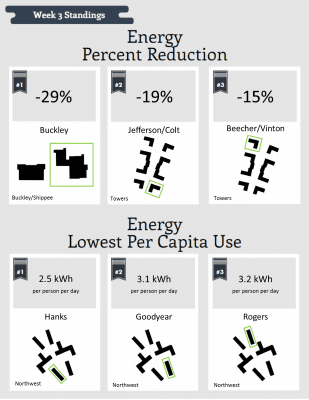 Although Beecher/Vinton is the winner of the energy reduction category, congratulations to Whitney for being such a strong contender in the competition. Shippee was close behind with a 5.2% reduction. Holcomb of East took first place in the per capita electricity usage category with 3.2 kWh used per student, followed by Hollister A/Hollister B of West with 3.3 kWh used per student. Buckley took third place with 3.4 kWh used per student. All around, these are very impressive numbers in electricity reduction! Allen/Kingston, Sprague, Beecher/Vinton and Holcomb – you are the winners of EcoMadness 2013! Congratulations again! You should be proud of yourself for demonstrating excellent conservation and sustainable lifestyle practices throughout the entire four weeks of the semester. Keep up the fantastic work even if EcoMadness is over. And of course, enjoy your ice cream party!! Glow in the Dark Frisbee/turn out the lights: Tell everyone to turn off the lights and go outside for an hour. We’ll provide you with the Frisbees and you just go have fun! 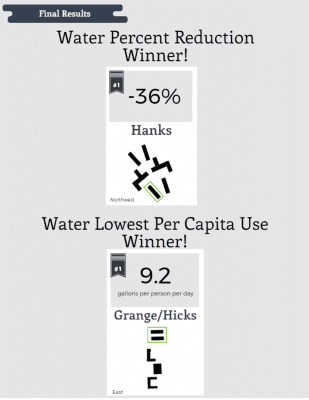 The top three who have owned the water reduction category since week two remained strong throughout the rest of the competition, all the way up until the end of the Double or Nothing week. 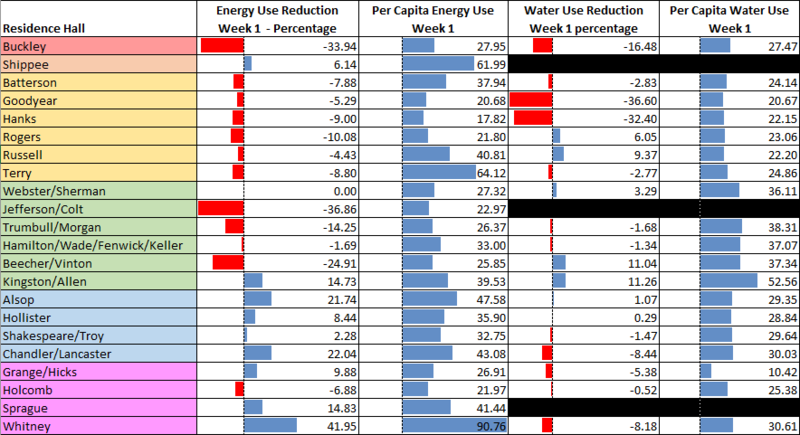 Sprague remained dominate the water reduction category since week two, ending up with 21.0% reduction at the end of the Double or Nothing week. Congratulations on first place, Sprague! Alsop held onto second place again, closing off with 13.0%. Like before, Whitney made third place, and ended with an 11.0% water reduction. A fantastic job all around, our top three water reduction finalists! 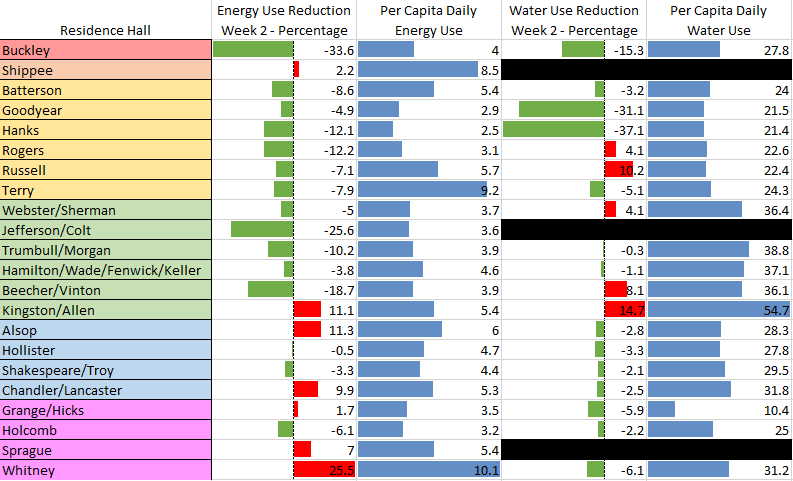 In terms of water usage per student, the top three of last week prevailed again. Hamilton/Wade/Fenwick/Keller of Towers managed to improve their 31.9 gallons per capita usage of last week, taking first place with an even 32.0 gallons. Congratulations! Terry of Northwest used less water per student this week than last week – 32.0 compared to 31.9 gallons. In third place, we have Sprague, pulling off 33.4 gallons used per student during week four. Way to go! The top three dorm buildings from last week appeared again in the energy reduction category, in a different order due to the Double or Nothing week. Whitney made an unanticipated leap from third place to first place, with 20.5% electricity reduction. Very impressive! Sherman/Webster was bumped down from their first place position of last week, taking second place with a 20.2% reduction, while Hollister moved from second place to third place with an 18.7% reduction. 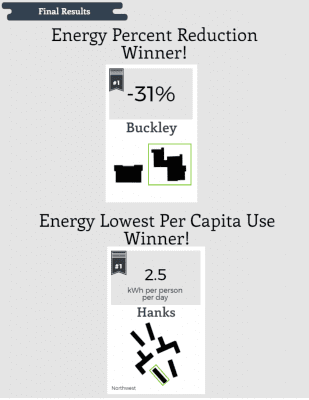 Buckley, again, claimed first place with 3.7 kWh in the energy usage per student category. Holcomb of East took second place with an improved ranking of 3.8 kWh per student, .1 gallons less than last week. There was a two-way tie for third between Batterson and Sherman/Webster, both of whom managed 4.0 kWh per student. Sprague, Hamilton/Wade/Fenwick/Keller, Whitney, Buckley – you are the winners of Eco-Madness! Congratulations again, and be proud of yourselves for demonstrating conservation and sustainable lifestyle practices throughout the entire five weeks of the competition! Keep up the fantastic work even if Eco-Madness is over, and enjoy your ice cream party!